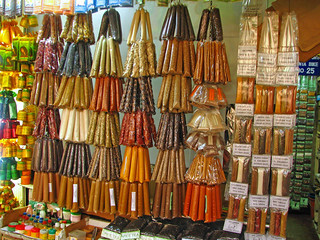 A bright display of spices at the Kandy Central Market. Sri Lanka is known for its fabulous spices in diversity, quantity and quality. Visions of cooking and sumptious meals danced in my head as I browsed these shops. Cardamon and cinnamon, nutmeg and chili, pepper and tumeric and amazing smelling vanilla. Kandy's Central Market, open only on Fridays was a fortuitous find through a helpful passerby. Stocking the same range of foods, spices, herbal tonics, crafts, textiles and factory-reject designer-brand clothing, it caters to the locals and is goernment run so there is one price and it is 200-300% cheaper than the tourist shops. There apparently used to be 3 on the island, but 2 were destroyed by the sunami and have not yet been rebuilt. The one in Kandy is the only one remaining. So if you are in Kandy on a Friday, ask for it, ditch your guide's and guesthoues's advice to frequent the pricey shops of their friends and stock up on your gifts here.